Join the Cedar Rapids Civil Rights Commission and the Cedar Rapids Public Library as we kick off the Martin Luther King, Jr. holiday an MLK Day Kick-Off and Public Employment Job Fair. Visit the Downtown Library on Sunday, January 17, starting at 2pm to view a special screening of the 2015 movie “Selma”. 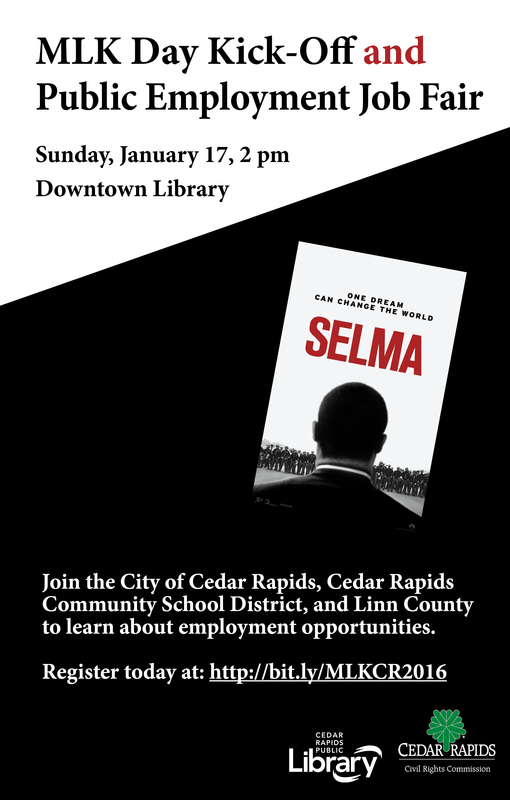 Following the film, interested persons will have the chance to speak with representatives from the City of Cedar Rapids, the Cedar Rapids Community School District, and Linn County on employment opportunities. The story of Dr. Martin Luther King, Jr.’s historic struggle to secure voting rights for all people — a dangerous and terrifying campaign that culminated with the epic march from Selma to Montgomery, Alabama, and led to President Johnson signing the Voting Rights Act of 1965. See the story unfold dramatically on screen in the Whipple Auditorium. Join us as we celebrate Dr. Martin Luther Kind, Jr.’s legacy and learn more about public employment opportunities available now. Register today at http://bit.ly/MLKCR2016 or call (319) 261-READ.